Hawkeye kicks off lesson 44 with a slide guitar exercise that will prepare you for some of the slide licks in Robert Johnson's "Ramblin' On My Mind." First, pick the note F at the 3rd fret of the first string. Then, slide up to the 12th fret. Be careful not to produce any unwanted fret noise when sliding. Once the 12th fret is reached, apply a vibrato with the slide. A vibrato is produced by wiggling the slide back and forth in a horizontal motion. Keep the slide parallel to the frets when performing a vibrato. Otherwise, you run the risk of playing a note that is out of tune. Practice this exercise on every string. Also, play through the exercise with each pair of adjacent strings. For example, pick the notes at the third fret of the first and second strings. Slide both notes up to the 12th fret and perform a vibrato. When playing double stops, make sure that both notes are in tune. If the slide does not remain parallel to the frets, one of the notes will sound slightly flat or sharp. The slide lick that Hawkeye demonstrates at 02:36 in the lesson video is used in countless blues and rock songs. Pick the second string and slide up to the 12th fret. Once you reach the 12th fret, pick the open first string. Apply a vibrato to both notes. The second lick that Hawkeye demonstrates is quite similar to the first. However, the third string is now included in the lick. Slide up to the 12th fret on the third string. While holding this note (F#), pick the notes on the first and second strings in a sequential fashion. Apply a vibrato to all three notes. This lick is an arpeggiation of a D major triad. Consequently, it can be used when playing over this chord. This lick features a slide from the 12th fret down to the 10th fret on the first string. Then, a D major chord is arpeggiated at the 12th fret of the second, third, and fourth strings. Lick 4 begins with a triplet rhythm played on the second string. It concludes with an F# and D note, which implies a D major triad. This lick is very similar to Lick 2. However, it ends with a slide to a D major chord played in 12th position. hawkeye, every time i slide to a fret, it either dies out or i here the other strings vibrating (and I am muting the other strings) is there any thing wrong i might be doing? Well, if it doesn't sound like what I'm doing ... no buzzing of strings and the note not dying out ... then I reckon you're doing something wrong. The 'touch' for slide is extremely light and takes a good deal of practice ... it sounds to me like you're being much too heavy with the slide ... lighten up ... as much as possible. A light touch, patience, and repetition are the keys to getting a good and accurate sound with the slide. I'm glad you're enjoying yourself and progressing, Rama. Thanks for the message and question. This is blues music, not classical music ... in blues music, YOU make the 'rules' ... via experimentation and creative self-expression ... the answer to your question is for you to try it, and if you like what you hear, then use it. Is an artist/painter free to mix his/her colors as he/she chooses? :-) Of course ... don't worry, you will not get 'injured' and nothing bad will happen if you experiment on the guitar. You will always learn something. I hope you continue to enjoy these lessons. Great exercise Hawkeye. I like your call on mamma please. Thanks, Terry. I hope you continue to enjoy these lessons. Hi Chris. Thanks for your comments and enjoying these lessons. My thumb is very lightly/barely in contact with the back of the neck, yes ... for stability going up and down the neck ... and to 'measure the depth' of the slide in relation to coming in contact with the strings ... gauging the distance so that the slide is not just 'suspended in space.' You'll get it ... enjoy the process of practicing and getting a 'clean' sound ... when you achieve it ... you'll know it ... it will feel and sound great. Thanks again for enjoying these lessons. Hawkeye, you are an amazing person. I haven't got as far as your lessons in Phase 2 yet, but i have looked at your performance of a song "I got ramblin' on my mind", and i think you are simply amazing, and of course a huge inspiration to me. I myself hope that one day i will learn to play the blues. Its a long hard way to it, but i'm sure its an amazing journey that i will start one day. God bless you. antonskv, Thanks so much for your kind comments. I hope you start on my blues guitar lessons in phase 2 soon ... you can play the blues!!! ... remember, the longest journey begins with the first step ... you have the rest of your life to enjoy the process and the music ... it's a long and winding road that has no end ... after 50 years of playing the guitar, I'm still learning. 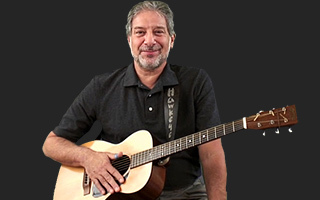 You can see/hear much more of my music for free here http://www.youtube.com/profile?user=HawkeyeH ... and there are free guitar lessons here http://hawkeyeherman.com/guitar-lessons.htm I hope you continue to find enjoyment and inspiration here at jamplay.com Again, thanks so much for your message. Inspirational -that's the only word for it. robearle, Thanks for the kind comment. You can do this! ... I hope you enjoy the process of learning and practicing blues guitar ... and I hope you'll continue to travel on the 'blues highway' with me.